Bubbles, bubbles, everywhere bubbles. There is a lot of talk about bubbles among commentators and central bankers. One of the most common bubble fears is a fear of a bubble in the US bond market (just take a look at this recent “bond bubble”-story). Generally I am very skeptical about all kinds of bubble fears and that also goes for the fear of a bubble in the US bond market. The general bond bubble story more or less assumes that quantitative easing from the Federal Reserve and other central banks has pushed down bond yields to artificially low levels and once QE is over the bond bubble will burst, bond yield will spike dramatically and send the US economy back into a major recession. Should we fear this? Not really in my mind and I will try to show that in this blog post. So I decided to do a little exercise: what 10-year interest rate would make sense given the CBO projection of unemployment and inflation over the next decade? … I decided to use the simplified Mankiw rule, which puts the same coefficient on core CPI inflation and unemployment. That is, it says that the Fed funds rate is a linear function of core CPI inflation minus the unemployment rate. Krugman is basically using the Mankiw rule to forecast the Fed funds rate 10 years ahead and then he compared this forecast with the 10-year US government bond yield. It turned out that the 10-year yield was pretty well in line with the forecasted path for Fed Funds rates. I will now show that that is still the case. I have recently been playing a bit with the Mankiw rule (see here and here) so it is only natural to re-do Krugman’s small “experiment”. Krugman is using CBO’s projections for core PCE inflation and unemployment. I will do the same (see the latest CBO forecast here) thing, but I will also use the FOMC’s recent projections (see here) for the same variables. I plug these projections into the Mankiw rule that I recently estimated. This gives us two forecasts for the Fed funds future rate for the coming 10-years. The graph below shows the two “forecasts”. Both forecasts (or maybe we should say simulations) point to interest rate hikes from the Fed in coming years. The forecast based on FOMC projections for unemployment and core inflation is a bit more “aggressive” in the rate hiking cycle than the Mankiw rule based on the CBO forecasts for the same variables. The reason for this is primarily that the FOMC members expect unemployment to drop faster than forecasted by the CBO. Both the FOMC and CBO expects inflation to gradually increase to 2% over the coming 4 years. The rule based on the FOMC projections indicates that the Fed funds target rate should be close to 3% in the “long run” (after 2018), while the CBO based rule is indicating a Fed funds rate around 2.6% i the long run. This difference is due to the FOMC expects unemployment at 5.0% in the long run, while the CBO expects unemployment at 5.5% in the long run. I should stress that this is not my forecasts for the Fed funds rate as such, but rather an illustration of how we should expect the Fed’s policy rate to development over the coming 10 years if the Mankiw rule in general holds and we use the FOMC and CBO’s macroeconomic forecasts as input in this rule. We can now use these “predictions” to construct a (quasi) yield curve. Not to make things overly complicated (and spending to much time calculating the stuff…) I have simply constructed the “yield curve” by saying that “forecast” for for example the 2-year yield is simply the average of the predicted of the Fed funds rate in 2014 and 2015. Similarly the 5-yield is the average of the forecasted policy rate for 2014-2019. Hence, I disregard compounded interest and coupon payments. The graph below shows the actual US yield curve compared with the two quasi-yield curve based on the two Mankiw rule based predictions for the Fed funds rate in the coming 10 years. 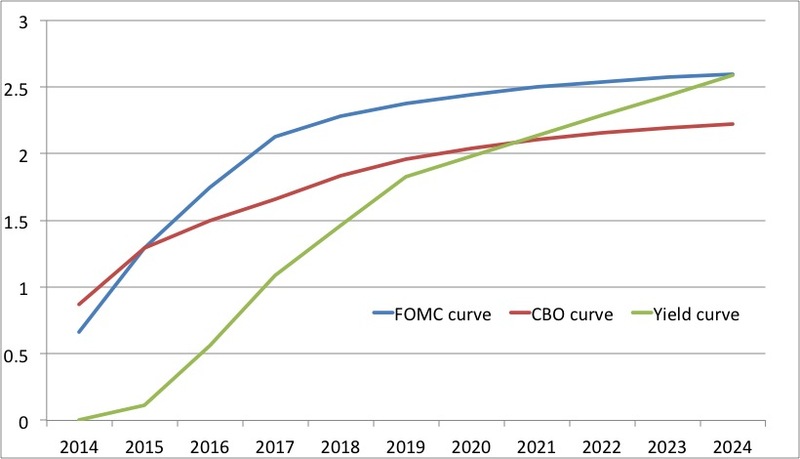 First of all we see that the FOMC curve and CBO curve are considerably “higher” than the actual yield curve for the next couple of years. This should not be a surprise given the fact that we already know that forecasts based on the Mankiw rule is too “hawkish” compared to the actual Fed policy in 2014. Hence, the “predicted” rate for 2014 is 75-100bp too high. The reason for this is among other things that the simple Mankiw rule does not take into account “discouraged worker”-effects on the labour market, which seems to have been a a major problem in the past 5-6 years. Furthermore, the rule ignores that the Fed over the past 5-6 years more or less consistently has undershot it’s 2% inflation target. I have discussed these factors in my previous post. These factors mean that we should probably pushed down the “rate path” in the next couple of years and that means that the yield curve does not look to be too “low” for 2-year or 5-years (very broadly speaking). Second, we see that if we look at the 10-year yield we see that it is more or less exactly where the FOMC curve “predict” it to be (around 2.6%). 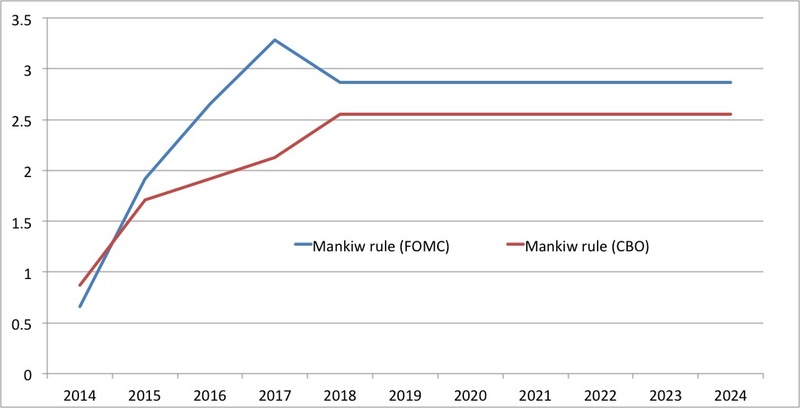 We can of course not directly compare the two as I have not taken compounded interest and coupon payments into account (which would push the FOMC curve up), but on the other hand we should also remember that the Mankiw rule is too “hawkish” for the “early period” (which should push the FOMC curve down along the curve). I believe that the discussion above shows that US bond yields pretty well reflect realistic expectations to Federal Reserve policy over the coming decade given the FOMC’s and the CBO’s expectations for US unemployment and core inflation and it is therefore hard in my view to justify the claim that there is a bubble in the US bond market. That of course does not mean that yields cannot go up. They very likely will if FOMC’s and CBO’s expectations particularly for the US labour market are correct. And the bond market might of course also be 50bp wrong is one or the other direction, but I find it very hard to see why US bond yields should suddenly spike 200 or 300bp as some of doomsayers are claiming. And finally I should stress that this is not investment advice and I am not making any recommendations to sell or buy US Treasury bonds and the market might go in whatever direction. Instead my point here is to argue that policy makers – the Fed – should not be overly concerned that quantitative easing has caused a bond bubble. It has not. If anything bond yields are this low because the Fed has not eased monetary policy enough rather than too much.